Style XP is not a skinning engine. It uses Microsoft's built-in visual style engine, but enhances it by providing many tools. Style XP can import, select, rotate & manage themes, visual styles, wallpapers, logons, bootscreens, icons, and explorer bar. Future versions may support sounds, cursors, screensavers, and packages of all the above. Instead of lines and gradients, the XP user interface natively supports the use of skinned bitmap controls. ...... This is Microsoft's own innovation. 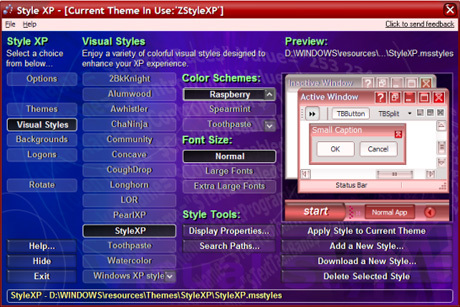 Style XP includes its own visual styles. Choose to have Style XP run in the system tray for easy management and selection of new styles, or turn Style XP off for zero-footprint operation. Style XP skins are zero-footprint because they use the same Visual Style Source that is built into XP. XP's Visual Style Engine will load and draw our start button with the exact code used to load and draw the infamous green start buttons of the original Blue, Olive Green, and Silver skins. Try out our new "CoughDrop" visual style and color schemes. "Toothpaste" and a community skin pack are also included. You can download more visual styles for free from our Links Page. Enable Windows XP styles for ANY application! Tap into the power of cascading style sheets (CSS) and XHTML! Software for rendering stunning designer interface graphics from basic shapes! JustStyle CSS Editor is full-featured yet easy-to-use software for webmasters. A component to design your program formular under Delphi. A realistic simulation of the video poker machines found in all casinos. Qweas is providing links to Style XP 3.19 as a courtesy, and makes no representations regarding Style XP or any other applications or any information related thereto. Any questions, complaints or claims regarding this application Style XP 3.19 must be directed to the appropriate software vendor. You may click the publisher link of Style XP on the top of this page to get more details about the vendor.